You are here: Home / About Farming & Food / What is the Best Meat to Grill? Do you get bored with the same old meals on the grill? There are so many different options – check out the best meat to grill, try some great recipes, and choose a new favorite! Plus, download your free printable cheat sheet to keep handy in your kitchen! What is the Best Cut of Meat to Grill? There are so many choices at the meat counter. How do you know what meat cuts can be cooked on the grill? Let’s take a walk down the meat counter and check them out! Beef is great on the grill. Ground beef can be made into hamburger patties, and those are so fast and easy to cook on the grill. Any beef steaks can also be cooked on the grill. Ribeyes and T-bones are the classic grilling steaks, but pretty much any beef cut with the word “steak” can be grilled. If you want to try something new, there are some lesser-known steaks that are amazing cooked quickly on the grill. Flat iron steak, skirt steak, flank steak, and hanger steak are very flavorful cuts of beef that can be easily grilled. This hanger steak is my new favorite steak recipe! The tips in this post will help you cook your steak perfectly, every time. Pork chops are a grilling staple in our house. Pork chops are the pork version of ribeye and T-bone steaks. But that’s not the only pork cut that can be grilled. Ham steaks are delicious, and so fast, to grill. Cured ham steaks only need to be heated through, and that can be done in just a few minutes on a hot grill. Pork ribs can also be cooked on the grill, but they need lower heat for a longer time. Try this recipe for Grilled Ham with Pineapple the next time you need a fast weeknight dinner. Chicken breasts are easy to grill. The boneless, skinless chicken breasts cook up pretty quickly, but they can become dry if they are over-cooked. (This recipe for marinated chicken breasts helps keep them from getting dry.) Chicken drumsticks can also be grilled. Drumsticks take a little more skill and patience to get them cooked thoroughly and evenly. Chicken thighs are my favorite on the grill. I use boneless, skinless chicken thighs. They grill quickly, cook evenly, and are very flavorful. Because chicken thighs have a little more fat than chicken breasts, they won’t dry out as quickly on the grill. These Grilled Cilantro-Lime Chicken Thighs are perfect for a summer cookout. Turkey on the grill? You bet! Turkey breast cutlets are available from the meat counter at your grocery store year round. Turkey breast cutlets are usually sliced pretty thin (about 1/2-3/4 inch thick), which means they will cook very quickly on the grill. And because turkey breast is very low fat, the cutlets can get dry and tough if they are over cooked. Marinating the turkey breast before grilling will help keep some of that moisture locked inside the meat. Of course, using a meat thermometer will help you get the cooked just right. Pick up some turkey breast cutlets the next time you’re at the grocery store, and try this Grilled Orange-Marinated Turkey Breast. It’s not always easy to tell if your dinner is finished cooking on the grill. A meat thermometer is the best way to be sure that meat is fully cooked. (I like this instant-read thermometer for grilling.) Check out this article for a summary of minimum internal temperatures for the different types of meat, and get a free printable cheat sheet to keep handy! 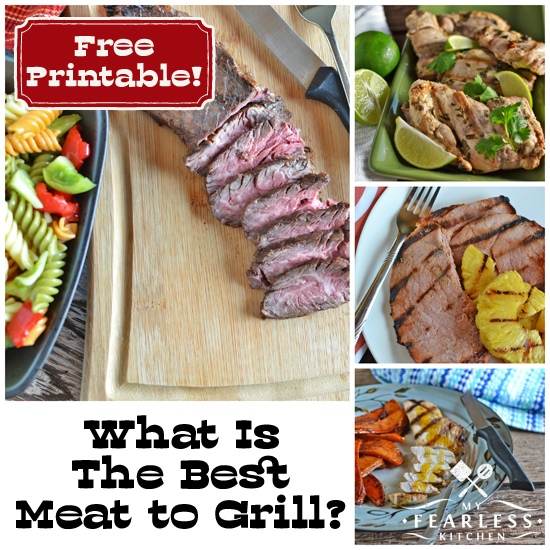 Download your free printable for “What is the Best Meat to Grill?” here! « What Do You Call The Boy Cows?